Home » Features » You’re Invited to a Union Housewarming Party! You’re Invited to a Union Housewarming Party! We’ll soon open three restaurants in Memorial Union, making our first floor complete. Wisconsin Union members are invited to celebrate with us at our Housewarming Party on Jan. 20. Like any good host does, we’re offering hors d’oeuvres, a warm ambiance and special party favors to our guests. 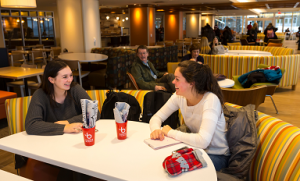 All Wisconsin Union members are encouraged to visit the Membership table in the Gekas Lounge (formerly the Trophy Room) between 5 p.m. and 7 p.m. to receive a limited time, members-only gift from our team. We want to thank you for your contributions to our organization. The spaces might be new, but we’re still the same family we’ve always been, and that is thanks to you. While you’re here, you can update your membership information and learn more about the perks of being a member of the Wisconsin Union. We want you to get everything you can out of your membership and to see for yourself the spaces you’ve helped make possible. After you’ve visited the Union Membership table, we invite you to enjoy the brand new Memorial Union restaurants, Carte and Strada. Carte is a sandwich and made-to-order salad shop with fresh and, in some cases, locally sourced ingredients. Strada, an Italian street food eatery, features hearth-fired pizzas, pasta dishes and piadinas—Italian flatbread sandwiches filled with cheese, meat and vegetables. Stay awhile! Not only is our staff happy to host this party, but the Wisconsin Union Directorate (WUD), the student programming and leadership board, has planned a variety of events to make the evening a true celebration. At 5 p.m., choose between a classic game of “Guess Who” with the WUD Distinguished Lecture series in Lakeview Lounge (formerly Lakefront on Langdon). Or, join WUD Cuisine and make cookies in a jar at Wheelhouse Studios. Then at 9 p.m., WUD Music will end the night the way any great party does – with lights, music and dancing. Rave in the Rath will feature DJ Boyfrrriend and Ian Carroll until 11:55 p.m.
Bring your appetite and dancing shoes, and we’ll see you at the party! Click here for information about the housewarming party at your campus home away.